Merry Christmas from the Denbows. your family is so cute! merry Christmas! What a fantastic pic! Happy Holidays to your beautiful family! it came out beautiful, love the idea of doilies to patch up the holes. . . i was able to set aside 2 days to sew up some gifts for my family. I made some sewing machine covers and plastic bag casings for my mom & sis, and pretty hair accessories for my niece. you guys are too cute. hope you had a wonderful Christmas!! 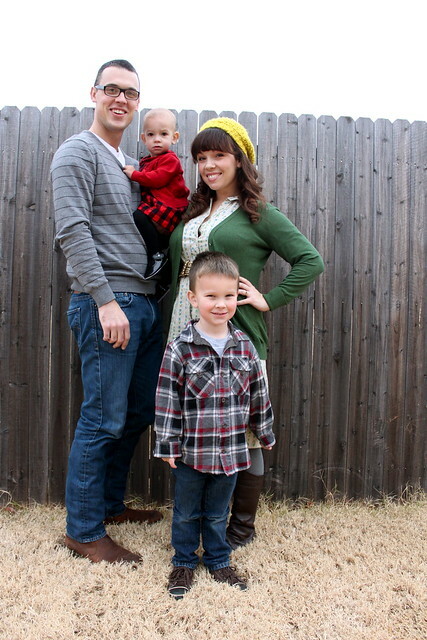 Great photo of your family Rachel!! You look *fabulous*! Hope you had a great holiday! Miss you!! You have such a lovely family! Merry Christmas! !